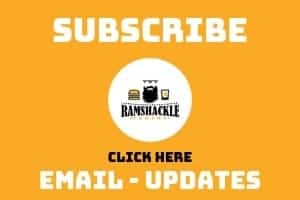 October 24, 2018 (Last Updated: March 8, 2019) - As an Amazon Associate I earn from qualifying purchases. If you found your way to this page, you probably know what Knefla soup is or want to learn about it. And if you don’t know what it is, STICK AROUND. I am happy to share what research I could find out about this classic German-inspired dish as part of this series. 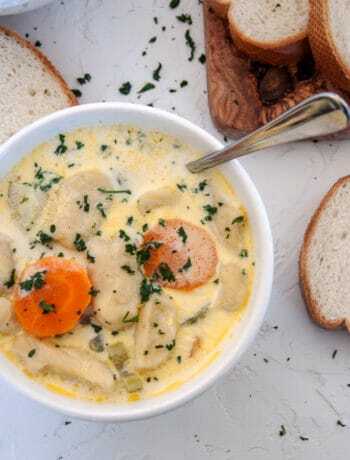 North Dakota, some parts of Minnesota, and South Dakota are really the only regions I have ever heard anybody mention the soup, so it seems regional and here is my traditional from-scratch recipe. The flavors, however, are universal. 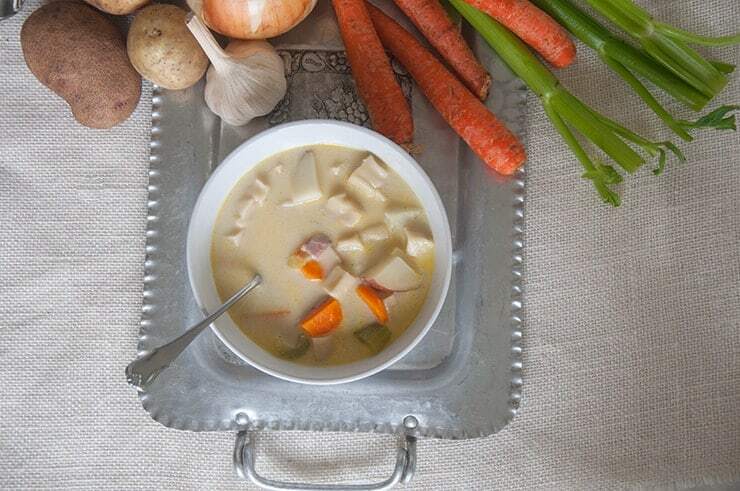 This soup has a long history with interesting origins that are related to the tale of my heritage. Knefla soup may be served in Germany, but the history I am going to share is the one that starts in Germany and leads us to the Upper Midwest of the USA. I am going to share the history soup I know. If you want to learn about what Knefla soup is and about the history of this dish, keep on reading! This is a German soup that surrounds the Knefla dumpling, which is a flour-based egg dumpling. It is served in a chicken broth that has cream and butter added to it. It will almost always have potatoes. Generally, it will have celery and carrots. 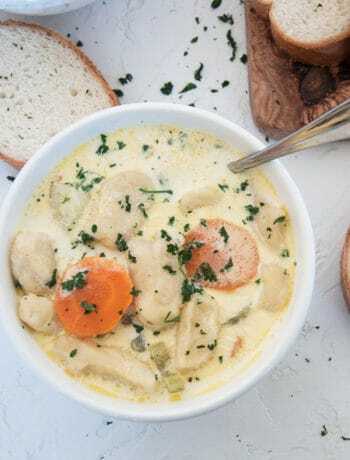 Basically, it is a lot of rich dairy in soup form with some tasty dumplings! It looks like this picture. A person could look through many church cookbooks in North Dakota and find several Knefla soup recipes. They may even have several different spellings. I have seen this soup spelled so many different ways and I am not 100% sure that any one of them is really right, so ‘whatever’ is what I am going to go with. The spelling I grew up with and know is Knoephla, but I am going to pretty much use several names in this series, as I don’t think a single one harkens back to the actual spelling. For this article, I am going to roll with Knefla. The origin of the word Knefla (as we know it) is from the German word Knöpfle. Literally translated into ‘Little Button’ and is a traditional German dumpling. It is a small cousin of the more popular German dumpling Spätzle. To bring it even more regional, Spätzle and Knöpfle is a Swabian regional food with a history that goes back to the early 18th century. What is interesting is that if you look up Knöpfle recipes on the internet, you will be returned Spätzle recipes, as though they are the same or very similar. I don’t doubt that Spätzle and Knöpfle are very similar dumplings in Germany, but the dumplings you find in a Knefla Soup in the midwest is different than Spätzle. For the sake of transparency, I have never made Spätzle and I am not sure I have tried it. I did, however, research for the sake of this series the dumpling and how it is made. What I found interesting is that Spätlze dough, prior to cooking, is more of a pancake batter texture. Then, the batter is either pushed through a colander, scraped off of a board into warm water, or put through a special piece of equipment to give the dumpling the same texture. Knefla dumplings, within the context of an Upper Midwest Soup, is not the same. For every Knefla recipe that I have seen in the upper midwest, you roll out your Knefla dumplings like you would any other dumpling. You mix it to a bread dough-like texture, then roll it out, to be cut into little buttons. I have used several sources of truth (church cookbooks) just to verify this and it is the case. Why Did The Dumpling Change? I don’t have the answer to this. Perhaps there is even a loss of translation where the German Knöpfle is more similar to the dumplings used in the Upper Midwest, but I don’t think so. If I were to make a guess, it would be a matter of practicality. In the 1800s in North Dakota, I would imagine that specialized cooking tools would be at a minimum. Making easy dumplings would be less of an endeavor than the wood scraping that Spätlze uses. Maybe this is why Knefla is more well known in North Dakota, as well. Yes, we still use Spätlze, but I would say that Knefla is more well known. The dumpling we know in North Dakota somehow changed from its German origin. To speculate why I think we need to briefly look why people from North Dakota are trying to make German food. As of 2009, almost 50% of North Dakota had German ancestry (me included) and 30% have Norweigan ancestry (me too). 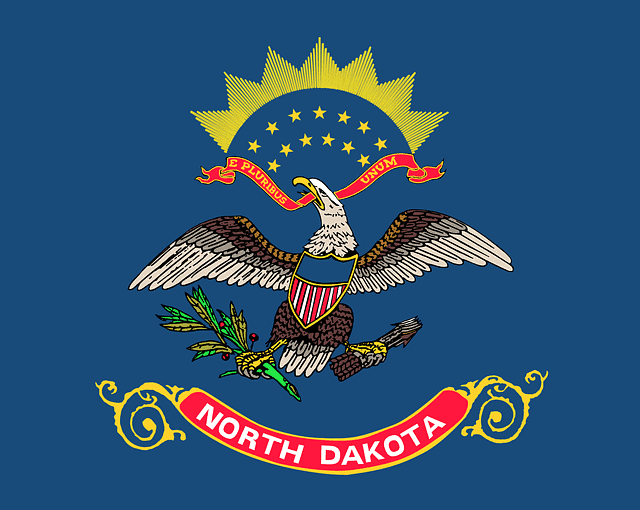 While there are other Germans that found their way to North Dakota, a considerable influx of the German population into this state came via Russia. Catherine the Great had tracts of land along a river that she sought to make productive. To help cultivate this land into production, in the late 1700s she wooed Germans to the area with promises of religious freedom, free land, and they would avoid Russian conscription. Not only was all of this promised to them, but all of their heirs, so their kids could not be drafted either. Many of these families were of Swabian origin (remember, where Spätzle was made) and had experience of working land near the Rhine river, so it seemed like a natural fit. Over time, many Germans immigrated to Russia with these promises of freedom. As time went on, the promises started being broken and their lives became more difficult. They were becoming peasants and exclusions were being removed. Their sons were being drafted into the military. By the late 1800s, America had offers of free land and religious freedom, as well. The same people decided to pick up and move in search of freedom. Many ended up in North Dakota. Why did Knoephla Immigrate With Them? Many of these people were Swabian, so this was the food they ate. Not to mention, North Dakota was a wheat producing part of the world, so it really was a natural fit for a flour dumpling to become a valued part of the diet. Why Did Knefla Turn Into Soup? If you look at Spätzle recipes, there are many different varieties of way so to serve it. As long as you have the dumplings, you are good to go. In fact, most often, it is served as dumplings with just butter. 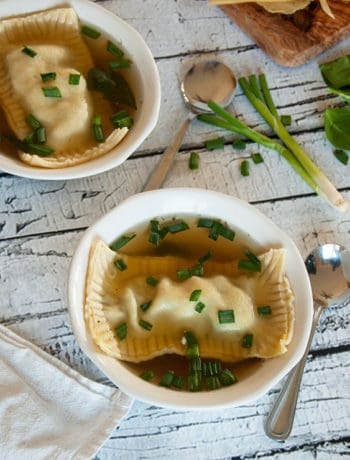 Rarely, however, in the context of the current culture of the Upper Midwest, would someone find Knephla Dumplings served in any other way than in soup form. It is a very specific recipe. To think about the ingredients of a traditional Knefla soup, why this dish evolved into a soup makes sense. We have the root vegetables of potato, carrots, and celery. These are all items that could have been kept throughout the Winter in a cellar, even in our very cold climates. Chicken, eggs, and dairy would also be available. Wheat? Well, we would have plenty of Wheat in North Dakota. Did I mention that the soup is awesome! It is calorie rich and would be a good meal for the homestead in the 1800s. To me, the evolution of this dumpling into a dumpling soup only makes sense. From its humble beginnings to, well, its humble present. Outside of the area, Knefla soup still isn’t that well known. Here is a testament to what North Dakotans think about Knephla from a local diner chain. 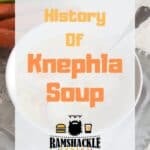 I hope you enjoyed this historical look at a local favorite, Knephla Soup. We have already cracked into the recipe making and we have an upcoming recipe that you are going to love. If you enjoyed this, consider getting updates via email and following me on Instagram. Interesting history. No idea that German immigration to the Midwest came via Russia. I had never heard of this soup, but I am a bit fan of spaetzle, and also a big fan of creamy soups, so I bet I’d enjoy it. It is an awesome soup. Interesting thing is that spaetzle really is a more well-known dish in general, but not in these parts. Almost everyone knows what knoephla soup is, but it gets a bit dicey on the spaetzle.